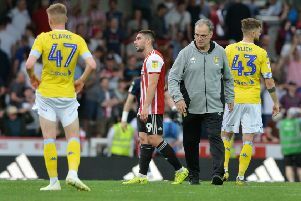 After being linked with several transfer moves on deadline day just two were completed by Leeds United as they brought in two strikers from abroad. There was no late drama over any big name signings with the Elland Road club completing a deal for an undisclosed fee for Pawel Cibicki from Malmo early in the day and completing the loan signing of Pierre-Michel Lasogga on a season-long loan from Hamburg SV following the successful completion of a medical around tea-time. The 25 year old German under 21 international has played at the top level in his country, initially joining Hamburg on loan from Hertha Berlin in 2013, scoring 13 goals in 18 starts, before making the move to the Volksparkstadion permanent in July 2014. Since then, Lasogga has netted 30 times in 107 games. The 6ft 2in striker became United’s 16th signing of the summer transfer window and will wear the number nine shirt. Leeds earlier confirmed the signing of 23-year-old centre-forward or winger Cibicki from Swedish side Malmo FF on a four-year deal. Cibicki made 30 starts for Malmo scoring 12 times, and also enjoyed a loan spell at Jönköpings Södra IF in 2016 scoring 10 goals. Although the player represented Poland at both under 19 and under 21 level, he has gone on to represent Sweden under 23s 10 times. He will wear the number 22 shirt for the Whites.